(Turtles of Sleepy Hollow Lake - 01) Sleepy Hollow Lake was frozen over until the 9th of April 2001 when the ice began to break up leaving wide gaps of open water. By the 10th the ice was gone. On Friday the 13th (no pun intended) the temperature was nearly 70 degrees when we put our canoe in the lake and ventured out over the cold water to see what had transpired during the winter. 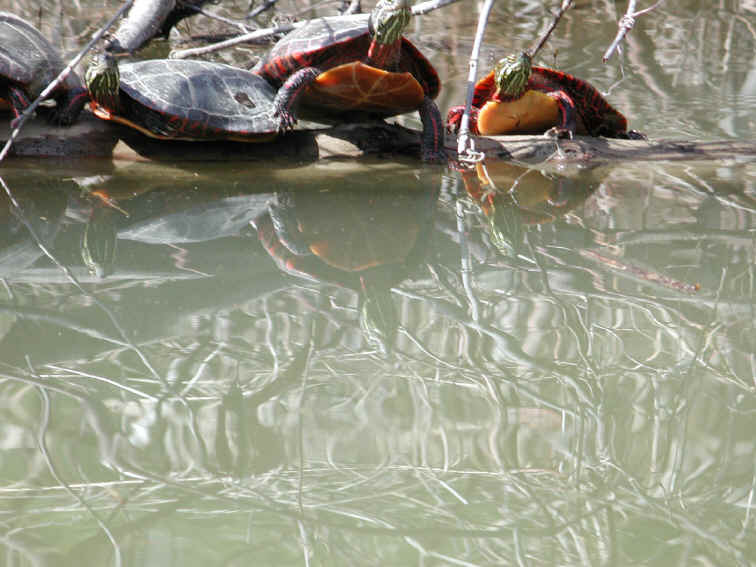 As we neared a sheltered area near the northeast end of the lake, we spotted several turtles fresh from their winter slumber, sunning themselves on a log. The reflection in the water added to our interest, as we hope it does yours. They're all part of God's creation that we are commanded to protect.